Nepal Rural Tour is one of the best tour packages to learn the real life, culture and tradition of Nepali people in the country side. 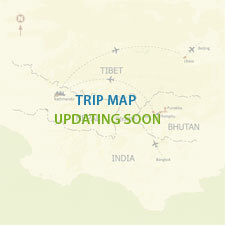 The major destinations of Nepal rural tour are listed below. Kakani: Kakani is situated in the north-west of Kathmandu valley. Kakani tour takes about two hours drive from Kathmandu city. Wonderful view of Himalayan ranges, including Gaurishanker (7134meter), Langtang, Choba Bhamare (6016meter) and Ganesh and Manaslu Himal (8163meter), is the main attraction of Kakani sightseeing. Palanchowk Bhagawati: Planchowk Bhagwati is a very popular temple of goddess Bhagawati which is known also as Kali. This temple in Kavre district is about 42km from Kathmandu and is about two hours drive from the Kathmandu city. This temple has a three feet long idol of goddess Kali, carved in a black stone. The statue of the is Kali the best example of workmanship in Nepal. Panouti: Panouti is one of the oldest Newari towns with beautiful old temples and traditional houses. Namo Buddha: Namo Buddha stupa is situated on top of the hill. To get to Namo Buddha it takes about two hours walking or 30 minutes drive from Panouti. Timal Narayan: Timal Narayan is a god dedicated to Lord Vishnu. Timal Narayan temple is situated at an altitude of 2,134 meter in Kavre district. The temple area is the best place to view the beautiful Gaurishanker Himal and many other peaks, including Sun Kosi (Gold River)..
Daman: Daman lies 80km south-west of Kathmandu valley at the height of 2,400 meter, which is about four hours drive from the Kathmandu city. This is the best view point to see the world's highest peak Mount Everest (8,848 meter), Dhaulagiri (8,167meter), Annapurna range, Gaurishanker and many other peaks. A view tower equipped with long range Telescope is in Daman. Charikot: Charikot, the headquarters of Dolakha district, provides spectacular mountain view of Gaurishanker Himal. It is about 133km far from Kathmandu. The very famous Bhimsen temple is in Charikot. Gorkha: Gorkha is the birthplace of King Prithivi Narayan Shah, the founder of modern Nepal. There is an old royal palace know as Gorkha Durbar . The palace situated on top of the hill is worth to visit. The solders of Gorkha who fought for the unification of Nepal are considered to be as brave as the world's renounced Gorkha solders. Tansen: Tansen is one of the historical places in western Nepal. This hilly town is the best place to tour in the summer. Tansen is the headquarters of Palpa district. Tansen is one of the cultural towns of Newari people outside the Kathmandu valley that offers you the wonderful panoramic views of snowcapped mountains. Antu Danda: Antu Danda is situated at an altitude of 1,677meter in Ilam district in eastern Nepal. Antu Danda is famous for its unique views of Mount Everest and Kanchenjunga. The hills of Darjeeling, India can be seen from Antu Danda. Tour to Antu Danda is an opportunity to see and enjoy the beautiful tea gardens. 01 Day: Arrival at Kathmandu international airport and transfer to the hotel in Kakani and rest. 02 Day: View sunrise with beautiful snowcapped mountains, including Langtang, Ganesh Himal, Manaslu and Annapurna range. Breakfast - drive to Swoyambhunath Stupa and sightseeing and overnight stay in Kathmandu hotel. 03 Day: Early in the morning drive to the airport for one hour mountain flight which approaches close to Mount Everest - drive back to hotel and breakfast. -Drive for a tour in Panouti, the old traditional Newari small city. Lunch is provided on the way at Dhulikhel with spectacular views of Himalaya and landscapes. -Drive to Nammobuddha and sightseeing -drive back to Kathmandu and farewell dinner with Nepali cultural program. 04 Day: Breakfast -drive to international airport and fly back to home/selected destination. -Drive for a tour in Panouti, the old traditional Newari small city. Lunch is provided on the way at Dhulikhel with spectacular views of Himalaya and landscapes -drive to Nammobuddha and sightseeing and drive Kathmandu and overnight stay. 04 Day: Breakfast - fly to Bhadrapur - drive leads to Ilam with beautiful Tea garden. Lunch is provided on the way. -Drive to Antu Danda and overnight stay in a local home. View sunrise and sunset as well as the spectacular view of Mount Everest and Kanchanganga. 05 Day: Breakfast -drive back to Bhdrapur and fly back Kathmandu. Farewell dinner with Nepali cultural progeamme. 06 Day: Breakfast -drive to International airport and fly back to home/selected destination. 01 Day: Arrival at the Kathmandu international airport and transfer to the hotel in Kakani. -Drive to Nammobuddha and sightseeing - a scenic drive to Charikot and stay overnight. 04 Day: Breakfast-drive to Palanchwok Bhagbati and view a beautiful Kali (goddess) temple -drive back to Dhulikhel and stay overnight there. 05 Day: Breakfast – a short walk to Timalnarayan temple. This is an excellent route to visit the village of Tamang people and to view beautiful landscape and Gauri Shanker Himal. -Drive to Daman a best view point of Nepal and overnight stay. The hotel lies in the middle of the forest. 06 Day: Breakfast-drive back to Kathmandu and visit Dakhsinkali temple and beautiful Buddhist monastery and Padma Sambhav Cave- stay overnight at Hattiban resort on top of the hill. 07 Day: Breakfast - drive to international airport and fly back to home/selected destination. 04 Day: Breakfast-view of beautiful Gaurishanker Himal-drive to Palanchwok Bhagbati and visit a beautiful Kali (goddess) temple -drive back to Dhulikhel and stay overnight. 05 Day: Breakfast – a short walk to Timalnarayan temple. This is an excellent route to visit the village of Tamang people and to view beautiful landscape and mountains -drive to Daman a best view point of Nepal and overnight stay. The hotel lies in the middle of the forest. 06 Day: Breakfast - drive to Gorkha an old Royal Palace the last monarchy of Shaha dynasty and overnight stay. 07 Day: Breakfast - drive to Tansen an old hill top Newari cultural city of Nepal and sightseeing and beautiful Mountain View from Shreenagar-on the way sightseeing in Pokhara and lunch in lakeside. 08 Day: Breakfast - drive to Bhairawa and fly back to Kathmandu and farewell dinner with Nepali cultural programme.